CMA CGM has regained most of the capacity it culled following its acquisition of APL and increased its fleet with the addition of 119,000 teu of newbuild deliveries, helping to drive its 2018 capacity offering up by 17.8% to 2.51m teu. Cosco’s operating capacity increase was a more modest 11.1% last year, to 1.8m teu. However, Alphaliner notes that this figure will be boosted this year by 700,000 teu of capacity from the purchase of OOCL, putting the Chinese state-owned carrier on a par with CMA CGM, before the addition of 319,000 teu of newbuild deliveries. Hapag-Lloyd, which has taken a conservative view on growing its fleet by ruling out any new ship orders, expanded its capacity during the past 12 months by just 4.7% to 1.55m teu – a figure that now includes 485,000 teu from the merged UASC business. The German carrier’s fifth-place ranking will also be threatened by the merger of the container businesses of K Line, MOL and NYK into ONE from April with the new entities current capacity at 1.48m teu, before the addition of some 150,000 teu of newbuild tonnage. Sixth-ranked carrier Evergreen, which announced an order for 20 11,000 teu ships last week, grew its capacity by 7% in 2017, according to Alphaliner data, to 1.06m teu. The consultant notes that the “biggest loser” in terms of capacity growth in the past 12 months was South Korean carrier Hyundai Merchant Marine (HMM), which saw its capacity plunge 23.9% to 347,000 teu. 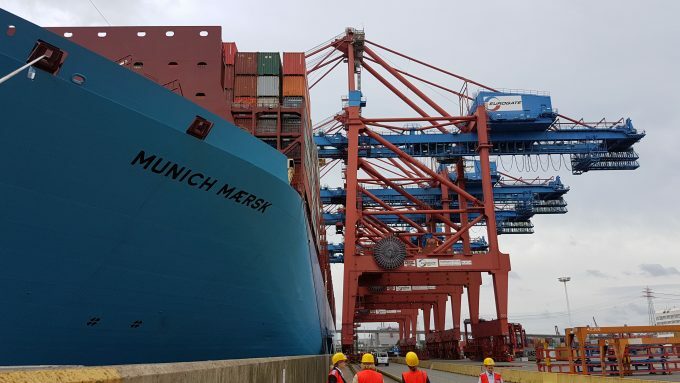 Alphaliner explained that HMM had been obliged to withdraw a number of ships – chartering them out to Maersk and MSC – as the condition of its ‘strategic cooperation agreement’, 2M+HMM alliance, which saw the Korean carrier reduced to the status of a slot charterer on the Asia-Europe trade. In HMM’s December 2018 Sales Strategy meeting, chief executive CK Yoo confirmed plans to order 22,000 teu ultra-large vessels, and in his new year message said the carrier would “continue to consider ways of doubling our vessel capacity by 2022”. However, this newly ambitious HMM will likely have to await until the end of its 2M alliance agreement before it could justify deploying ULCVs.